Dwight Arnold Hines, 55 of Elkton, MD passed away Wednesday, March 21, 2007. Born in Elkton, MD, on December 28, 1951, he was the son of the late William and the late Mary Ruth Hendrick Hines. Dwight was the husband of 27 years of Susan Peel Hines of Elkton. Dwight served in the Army during the Vietnam War and retired from Glasgow DuPont after 22 years. Dwight attended Trinity Episcopal Church, Elkton, MD. He loved all sports, especially golf and fishing and was an avid reader. He was a loving and compassionate person and will be sadly missed by all. In addition to his wife, survivors include: son, Brandon and daughters: Natalie and Mary Hines, of Elkton; three grandchildren: Katlynn and Brittany Hines, and Malakai Brown, of Elkton; siblings: Connie Wilson and her husband Curtis, Elkton, William Hines and his wife Sharon, Chestertown, Ronald Hines and his wife Betty and Douglas Hines and his wife Sarah all of Elkton. 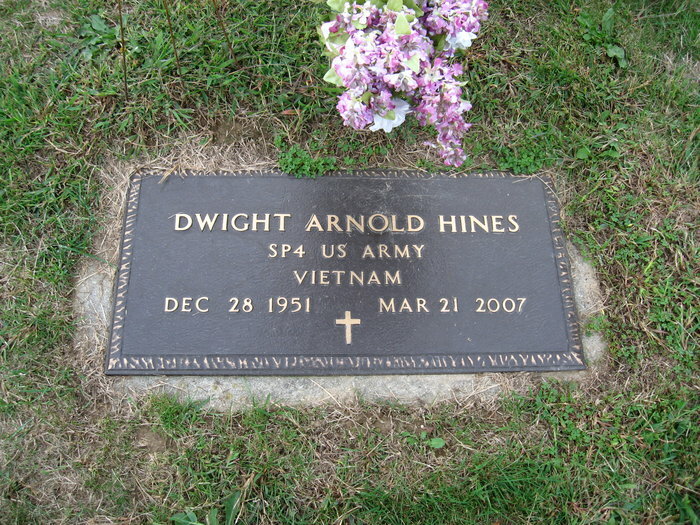 In addition to his late parents, he was predeceased by a sister, Beverly Hines. Funeral service will be held Tuesday, March 27, 2007 at 11:00 AM at Crouch Funeral Home, 127 South Main Street, North East, MD, where family and friends may call Monday evening from 6:00 PM until 8:00 PM and also one hour prior to the service Tuesday. Rev. Beverly Porteus will officiate. Interment with full military honors will be in North East Methodist Cemetery, North East, MD. For condolences, visit www.crouchfuneralhome.com.